oh yeah, would you mind full-view-ing this one? ;) i worked hard on the kimono so hope you like it! argh, the background is so ugly isn't it? gomen.. it took me days to finish this, lots of layers.. gah, my computer can't take it. just hope you like this one. 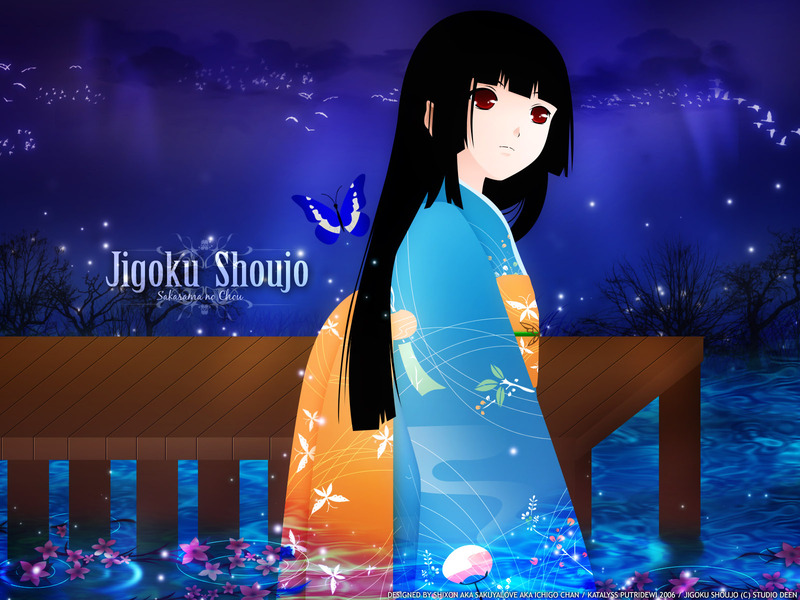 SPREAD THE LOVE OF JIGOKU SHOUJO. it's airing on animax at 24th of october. I love the colors, thy're all blended well so nicely. The vectoring is neat and flawless, it's hard to find fault in it. I also love her kimono, the butterflies and the flowers, they add so much emotion and depth to the wallie. Very nice, I love the feeling it gives. How can you say that? The bg is beautifully made and it totally blend with Enma Ai! Nice! :D I love the kimono! It looks great! It's a really nice change to see Enma Ai in something other than red or black. :) Good work on the vector and I guess that your hard work paid off! It looks awesome! UWAAAA! That is officially the most beautiful wallpaper I think I've seen! I love it; it is such a gret job! Not to mention, I love Jigoku Shoujo! Please keep making wallpapers of this caliber; it's awesome. Thank you! beautiful work. i like this color use of the night sky. I love the flowers floating above the water, under the bridge. Finally! A Jigoku Shoujo wallpaper! I was looking and looking everywhere, but I couldn't find any that I liked! Fantastic Vector and colouring. It seems so peaceful for someone who is from hell. very nice! nice one.. first time for me to see a jikogu shoujo wall brimming with soft light. the haunted aura is gone somehow.. it's peaceful. Wow such a stunning wallpaper. Her kimono is SOOO BEAUTIFUL, really love this wall, looks so awesome ! hope to see more, thxs !